Access your garage and home without the use of a key or a remote control. The Liftmaster 377LM Keyless Base 315 MHz Security+® Wireless Keyless Entry can open your garage door using a code that you program directly into the unit. There is also a temporary password option that enables family, friends, or service people to enter the garage without giving them your personal code.Access your garage and home without the use of a key or a remote control. The LiftMaster® Security+® Wireless Keyless Entry can open your garage door using a code that you program directly into the unit. There is also a temporary password option that enables family, friends, or service people to enter the garage without giving them your personal code. Security+® rolling code technology assures a new code is sent every time the keypad is used. Temporary password option enables friends or service people to enter the garage without giving them your personal code. Completely wireless powered by one 9-volt battery (included). Backlit keypad makes numbers easy to see, even in the dark. One-button-to-close feature makes it easier than ever to close your garage door (available on model 377LM only). Programs in 2 easy steps. 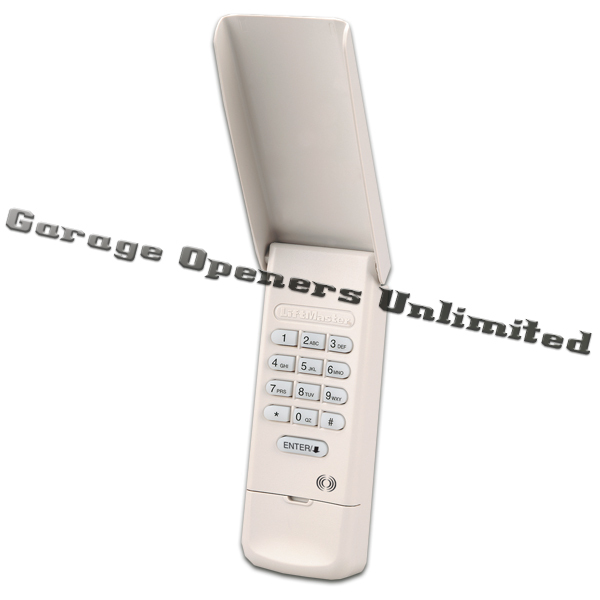 The Liftmaster 377LM Keyless Base 315 MHz frequency of your garage door opener will determine what keyless entry system will work with your system. See below to find out which keyless entry to order. - For use with any 315 MHz SECURITY ® garage door openers having a purple learn button. - Personalized Password: Up to 10,000 possible combinations. - Password can be easily changed if desired. - Temporary Password: Can be added for visitors or service persons. This temporary password can be limited to a programmable number of hours or a programmable number of entries. - Rolling Code: While your password remains constant until you change it, the code between the Keyless Entry and the receiver changes with each use, randomly accessing over 100 billion new codes. - Operation: Opener activates when 4-digit password and ENTER button is pressed. - If wrong numbers are accidentally pressed, correction can be made immediately. The ENTER button will transmit only the last four digits. - The keypad will blink for 15 seconds after the password is transmitted. During that time the ENTER button can be used to stop or reverse the door travel. door control push button and the Liftmaster 377LM Keyless Base 315 MHz Keyless Entry.